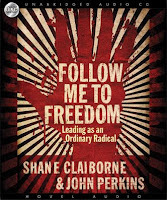 ﻿In follow me to freedom, Shane Claiborne and John Perkins discuss what it means for Christians to be followers and leaders. The book takes the form of conversations between the two authors. 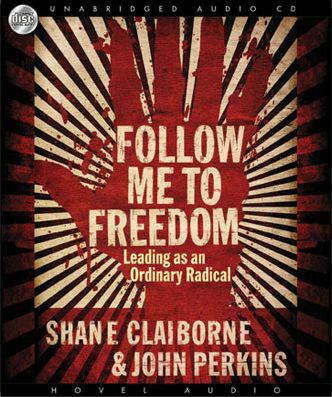 Being in conversation format, the book does tend to jump around topics a bit between a diverse range of topics surrounding following Jesus and leading people. If you can keep up with the disjointedness, there is a lot of interest in the book. Perkins is an older African-American civil rights leader and Claiborne is a younger social justice activist so between them they tell a lot of interesting stories. Both of them have put a lot of effort into thinking through and living out their convictions which shows through in the book. Claibourne does have a reputation for being a bit liberal. I didn't think think he was too liberal theologically here, although some might find his ideas about things like civil disobedience a bit out there. I appreciated some of the theological input from Perkins. I also liked that they focused a lot on servant leadership, rather than the power driven type of leadership that often shows up inside and outside the church. I "read" this book in audiobook format. The narrators did a good job of embodying the character of the authors and having the two narrators made it easier to follow. Maybe because the book was not narrated by the authors, some of the dialogue sounded a bit forced. You probably won't agree with all of what they say, but I think there is enough good food for thought in the book to make it worth reading.